Maine enters a new world, where advocates like Jason Savage don't have to take responsibility for their words. 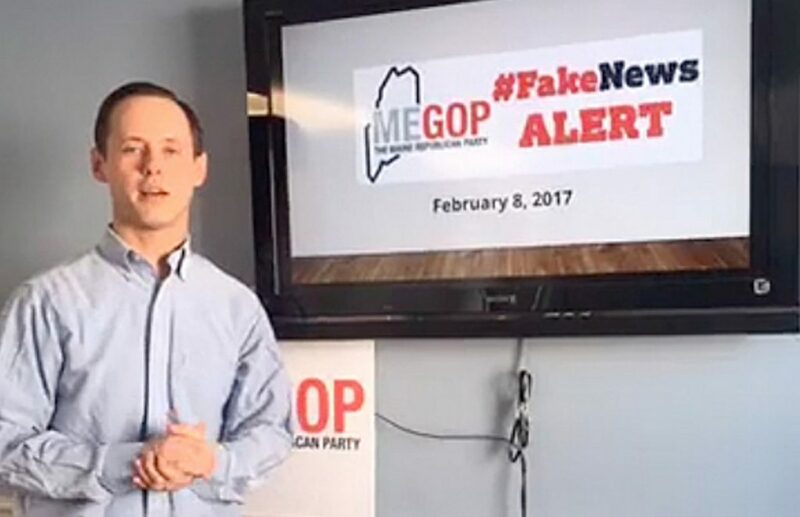 Jason Savage, the Maine Republican Party's executive director, says that he had hidden his identity as the creator of the Maine Examiner because he wanted it to become "a larger, more robust entity" and sought to avoid attacks that would come if "certain people" knew about his role. Saddle up and say “howdy,” folks! The Maine Commission on Governmental Ethics just made sure that the 2018 election is going to be fought in the Wild, Wild West. On Thursday, the public board that is supposed to oversee election practices determined that there was nothing worth investigating in the complaint against the Maine Republican Party’s executive director, Jason Savage, who had been caught running an anonymous “news” website that published negative stories about Ben Chin, a Democratic candidate for mayor in Lewiston. Those stories, which falsely claimed that Chin called the people of that city “a bunch of racists,” were then distributed via the Republican Party’s social media platforms without disclosing who had written them. Chin ended up losing by 145 votes. Savage eventually admitted to running the Maine Examiner, but said it had nothing to do with his day job, claiming that the website was something he did after hours, making it journalism and not electioneering. The ethics committee split 3-2 in Savage’s favor, with the majority finding that what this political operative did to influence that particular election was a hobby, not politics. Why? Because he said so. And that’s where our Western gets started. Fade in: The sheriff has tossed his badge into the dusty street and is headed for the saloon while the outlaws can’t believe their good luck. The commission’s decision could have made sense if local campaigns were still limited to door-knocking and postcards, but the world has changed. Advocates can set up websites at virtually no cost that look just like legitimate news outlets. Social media tools allow advertisers to search the web for potential customers by analyzing their browsing histories, and send out information designed to motivate them. Political campaigns can combine these capabilities to plant a seed with specific voters, who will then facilitate the viral spread of a message. And advocates can do it without taking any responsibility for the truth of the content. Donald Trump’s 2016 presidential campaign revolutionized this approach, proving that targeted social media can be more effective than massive ad buys. The Maine Republican Party has just shown that the strategy can be deployed on the micro local level. You might think that the people who regulate election practices would want to look at this kind of campaigning. But the Maine Commission on Governmental Ethics decided that if it looks like it came out of a newspaper, that’s good enough for them. Savage has previewed the absurdly simple all-purpose excuse. Yes, he is a party official, he said, but when he was writing anti-Chin propaganda, it was on his own time. And the majority of the ethics commission played right along, acting as if the only issue was whether or not Savage had punched out at work before he began playing around at journalism. But the question isn’t when Savage was smearing Chin – it’s how he was doing it and why. And the commissioners didn’t need a big investigation to answer those questions, because Savage told them. Savage explained that he had hidden his identity as the creator of the Maine Examiner because he wanted it to become “a larger, more robust entity” and sought to avoid attacks that would come if “certain people” knew about his role. In other words, the Maine Examiner would have been less valuable if people had known what it really was – a political advertisement masquerading as journalism. The ethics commission chose to believe the mask and not listen to the man behind it. Maine law would require campaigns and other groups to disclose their involvement if a message like the Chin allegations had been sent in the mail, printed in an ad or broadcast on television or radio. But, apparently, political operatives can send anything they want over the internet as long as they make it look like journalism, and the paid staffer who wrote it swears he did it in his free time. The ethics commission should have seen this complaint as a timely opportunity to examine how local races may be affected by new campaign technology. The commission had a duty to at least permit its staff to dig deeper than Savage’s assertions, especially since he had lied about his involvement in the Maine Examiner before he was caught. Instead, the commission is going to pretend that it didn’t see anything. There’s no sheriff in town, folks. Welcome to the Wild, Wild West.